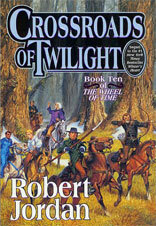 NOTE: In a 2004 interview with Wotmania, Jordan indicates that all of the major sections of Crossroads of Twilight all start on the same day. In a post to his blog in October of 2005 Jordan says that he regrets doing this, and wishes that he had used a more conventional linear approach. I certainly agree! NOTE: The reference to Tuon having disappeared nine/ten nights ago is at odds with events in the chapters before and after Chapter 4. Chapters 3 and 5 both take place on the day that saidin is cleansed, which is five days after Tuon was captured by Mat. The only logical solution is that Chapter 4 has been intentionally placed out of chronological order. NOTE: Because of the overlapping events that occur on the day that saidin is cleansed, it is almost impossible to determine the exact order of events of the various plotlines, and their placement here is almost entirely arbitrary.